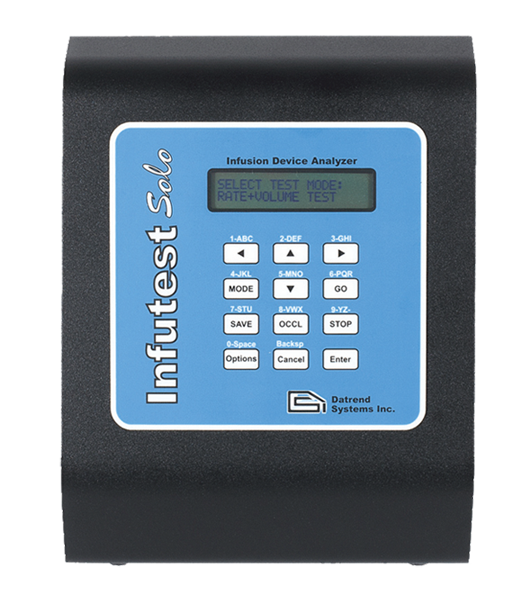 The Infutest Solo has internal memory storage for up to 120 tests. Or, since Solo is a member of the Datrend ES601 Plus System Connectivity Family, you can connect Solo to the ES601 Plus program any of its 60 Tester Autosequences to automatically execute the infusion device test protocol of your choice. When not connected to the ES601 Plus, it’s still easy to get information about the device under test into Solo. Just use the front panel keypad to enter or connect an external barcode reader to scan the control number of the pump you are testing. Store the test results on all of the pumps you process, then transfer the test data to the Infutest Solo PC Utility Software at your convenience via USB or RS232. It’s that easy! Portability – Infutest Solo allows both line and battery operation. Battery provides up to 30 hours of continuous operation. Multi Pump Test Results – Infutest Solo will retain the test results for more than 120 pump tests in internal memory until downloaded to a PC. Data Transfer – Infutest Solo comes complete with Windows based data transfer program (DTP-Solo) for quick and easy data transfer, plus organization and printing of test results. ES601 Plus Connectivity – Connect Solo to your ES601 Plus Automated Electrical Safety & Performance Analyzer for the ultimate in capability and flexibility! Internal 12V NiCad, operation time (approx) 30 hours. Infutest Solo is for those with a light to moderate infusion device testing workload, where a high level of precision is desired.